Congratulations to "Erin F", the winner of Carmen's giveaway. Thank you to all who participated! 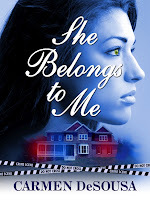 Hello, dear readers, I’m Carmen DeSousa, a newcomer on the block, but I believe you will enjoy my novel SHE BELONGS TO ME. Readers who adore J.D. Robb/Nora Roberts, Kat Martin, Iris Johansen, and Nicholas Sparks have been loving it; in fact, She Belongs to Me has been neighbors with all these great authors on Amazon’s top 100 paid bestsellers in romantic suspense. I brought the mini synopsis with me to share with you, and below, I found an archived email of She Belongs to Me’s protagonist, Jaynee. "After secrets and a mysterious background leave a wife’s life hanging by a thread, a husband must look for answers in the only place he knows—the past. When wealthy construction company owner and Charlotte detective, Jordan Monroe, meets Jaynee for the first time he is awestruck and determines to make her his wife. Jaynee, however, has a history she cannot easily overcome and is fearful to submit to love. Jordan succeeds in making her his wife, but five years into their marriage, he realizes she is keeping secrets. Before he can decipher her duplicity, he discovers her unconscious in their home from a gunshot wound only hours after giving her an ultimatum concerning their relationship. With Jaynee’s life hanging in the balance, the mystery of her past drives Jordan to investigate. But what appears to be an attempted suicide turns out to be something far darker. Is someone from her past stalking her? Or worse, is someone close to Jordan trying to kill them both? As Jordan edges closer to the truth, it may be deadlier than he could ever have imagined." The night of the shooting, Jaynee typed an email to her best friend; unfortunately, as the vehicle pulled up in front of the house, Jaynee deleted it, or at least she thought she did. I really should have called, but I know how crazy busy you are, so I didn’t want to disturb you. I promise to call soon, but right now, I just have to tell you what’s happened in the last few days, as I know you are the only one who knows everything about my past and will understand. First of all, as we discussed before, that “Big Thing” I told you I might do…well, it might just happen. I’ve been on the phone every day, working through the specifics, so I’ll let you know. And guess who showed up… Yep, you guessed right. I’m not sure what to do. There’s no telling what Jordan will do if he finds out. Oh, someone’s pulling up; I’ll talk to you later. So as you read in the mini synopsis, Jaynee ends up with a gunshot wound to the head. The question is why or who? I will be giving away a digital copy of She Belongs to Me to one lucky commenter! Giveaway ends 9pm EST April 6th. Please supply your email in the post. You may use spaces or full text for security. (ex. jsmith at gmail dot com) If you do not wish to supply your email, or have trouble posting, please email justromanticsuspense @ gmail.com with a subject title of JRS GIVEAWAY to be entered in the current giveaway. 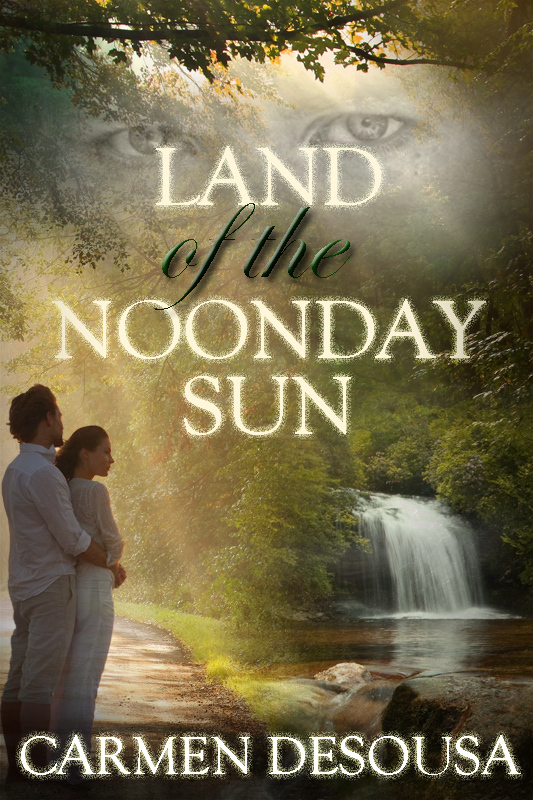 Land of the Noonday Sun, which will be available next month! This was a really good book for those that have not read it yet. Jordan and Jaynee are not your typical hero and heroine which makes the book so interesting. I just love how the books shows that true love can last if you want it to. I can't wait for your next book, Carmen! Thank you, Amy. I'm so glad you enjoyed it. Thank you for having me over, Maureen. I look forward to meeting all your lovely guests. Whoo, another book to add to my (already epic) TBR queue! I swear, at the rate at which I add new authors & books to my Kindle, I'm never going to clear the backlog. Reading/getting caught up should be my full-time job :-). And congratulations on the upcoming release! Thank you, Cris, and I certainly understand. I've lost count of my TBR file. LOL! Have an awesome day! Your book "She Belongs To Me" sounds brilliant Carmen. I am very interested in reading it. Also, contratulations on your new book! Thank you, Janet. Have a wonderful day. Happy reading! Carmen thank you for sharing your book with us. You have me very curious about Jaynee and her secrets... I love a book that has you wanting answers... SHE BELONGS TO ME sounds wonderful! Thank you, Colleen. And if you like mysteries smothered in romance and suspense, you'll love "She Belongs to Me". I love keeping everyone guessing. And according to the general consensus in the reviews...readers are always guessing. LOL! The synopsis sounds very interesting. My favorite kind of book is romantic suspense. I would love to win a copy. I am always looking for new authors. Thanks for the giveaway. Gator_trish at msn dot com. Thank you for stopping by, Trish. You are officially registered. Look forward to talking with you in the future. The book sounds very intriguing and suspenseful. Thanks for the giveaway. Thank you for leaving a comment. Feel free to connect with me on Twitter, where I love talking about writing and books. Thank you, Debra, and thanks for taking the time to leave a comment. Please feel free to look me up on Twitter. I find lots of new authors and share them with my friends. Since I've already read the book, and loved it, I might add, I do not need to be added to the drawing. Just wanted to drop by and read an interview with one of my favorite new authors. Carmen, great work keeping me drawn into the story from the first page! I look forward to reading your second book! Thanks, MJ! And thank you for the wonderful support, as always. You're awesome! Oh! This one sounds good! The characters are intriguing and I can't wait to get to know them. Added this book to my TBR list! Thank you for stopping by, Erin. And thank you for the compliment. I so love a story about true love and HEA. I even love a story with mystery. Me too, Kai! I definitely love mystery and romance, and I try to douse my readers with a healthy helping of both, all smothered in suspense. Love the synopsis you posted - have added it to my list. I noticed that while Amazon offers both paper and digital versions, Barnes and Noble only carries the paperback. Will SHE BELONGS TO ME eventually be offered in a Nook format? Thank you, Mary, and yes, both novels will be available at all other retailers in digital formats. "She Belongs to Me" will be available at B & N in just a couple of weeks, and "Land of the Noonday Sun" in May. Another good looking story to add to my pile. This is such a good way of finding authors. I'm looking forward to reading your books. Thank you, Laurie, and thank you for leaving a comment. Looking forward to the read and I plan to follow you on Twitter too. I'm a die hard Romantic Suspense fan. Nice to have a new author on my list. Thank you, Kelly. I look forward to chatting with you on Twitter, and now that I think about it, I believe I did reply to you today. I will follow you back, but it takes me a while to go through my new follows, so hang in there and I'll find you. Oooh I like the sounds of this. I've been looking for a good romantic suspense. I hope you enjoy, Tonya! Thanks for commenting.